6th August 2015 | filed under Aesthetic Treatments, Face, Non Surgical. Lip augmentation is a cosmetic procedure that gives the appearance of much fuller looking lips. It’s been incredibly popular over the last few years, to the point where it’s almost considered as a part of people’s beauty regime. At our cosmetic skin clinic in the Channel Islands, non surgical lip enhancements are one of the treatments that we offer, so we consider ourselves as being pretty knowledgeable on the subject. To help those who might be considering getting lip enhancements, or just to shed some light on the procedure, here’s a guide with everything you need to know. As we said earlier, lip augmentation is a cosmetic procedure that gives the lips more volume. The most common type is an injectable dermal filler. 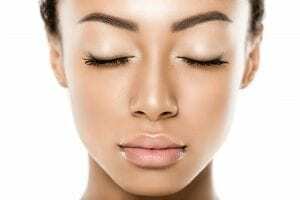 There are a number of different dermal fillers that are used on the lips and around the mouth, but the most popular seems to be those that contain substances such as hyaluronic acid – a natural substance that is in the body. Other methods can include fat injections and implants, but these have become a lot less common. Hyaluronic acid is found in the body and is used to add shape, structure and volume to the lips. It usually lasts around 4-6 months, and after this period more injections will be needed. There are several different types of hyaluronic acid fillers used, including Juvederm, Restylane, and Hylaform. You can choose how much substance is pumped into your lips, giving you complete control over how much volume is added. There is generally a lot less bruising than any other method. The results last a lot longer. Why do people get lip augmentation? The main reason for why people want lip augmentation is to improve the appearance of their lips. As people age, the lips begin to lose their volume and definition – something that leads people to lose their self confidence. The lips begin to thin as we leave our twenties behind, with wrinkles around the mouth becoming a lot more noticeable. Therefore, lip enhancements become an easy way for people to inject some volume back into their lips. There is little to no downtime involved with lip augmentation, and it can often be performed fairly quickly from a cosmetic practice. A numbing treatment can be administered beforehand so that you can’t feel the injection as it happens. A fine needle is then used to inject the substance. After the procedure you should be able to notice the difference straight away, and you are advised to avoid any lip products until they have began to look more natural (and any swelling has gone down). On a more serious note, infection and allergic reactions could occur but this is extremely rare. It’s important to consult a medical professional if you are worried about this happening. When considering getting any type of cosmetic procedure, it should be a decision that you made yourself. However, we hope that this information guide has helped give you some real facts on the lip augmentation. If you would like to speak to a member of our experienced team about lip fillers in Belfast, Guernsey or Jersey, or any other surgical or non surgical procedure that we offer here at our skin clinics, please don’t hesitate to contact us. Our medical team have been offering cosmetic treatments for over 20 years, and they have the experience that makes you know that you’re in safe hands. Give us a call on 01481 736 699 and a member of our team will be happy to answer any questions.